Mary Jo Potter has been an active entrepreneur and investor for 30 years. Having sold a business to McGraw Hill, she became active in Angel Investing in Chicago, and upon moving to the Bay Area, she joined Keiretsu Forum 15 years ago. She has invested in a variety of entities, but is now focused on the healthcare sector. Mary Jo is also a GP and on the investment committee of Keiretsu Forum. 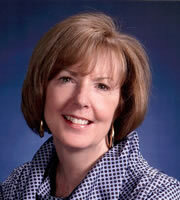 Mary Jo has held executive positions with BDC Advisors, Highperlink, Sibson and Omega Performance. Her clients have included Kaiser, Partners, Trinity Health, WEBMD, Sutter, and Genentech. She has held or is currently on many boards, including CHW/Dignity, CHI, Ocular Sciences, UC School of Public Health, Hope Unlimited in Brazil, Compli, Jean Paul in France, Northwestern University School of Social Policy, and NACD. She has a Bachelors from Siena Heights University, a Masters from Northwestern University, and has done an Executive program at Stanford in India. In her ‘spare” time, Mary Jo enjoys tennis, cooking, travelling wherever airplanes fly, and working with disadvantaged young people.